Toyota has entered into a technological collaboration agreement with Massachusetts, United States based WiTricity Corporation* concerning the practical application of automotive wireless charging systems and the promotion of their widespread use. TMC plans to participate in a WiTricity capital increase. WiTricity's charging technology uses resonance, which allows charging without direct contact and is more efficient than electromagnetic-induction, another wireless technology—but one that requires contact—that is starting to come of age in mobile phone and other chargers. TMC believes that resonance wireless charging is suitable for automobiles and aims for its early practical use. The collaboration is aimed to accelerate development and eventual implementation of wireless charging for automobiles. 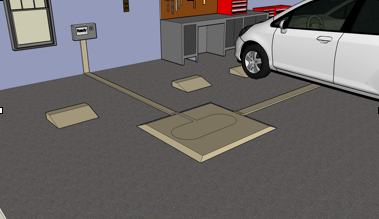 The charging of a plug-in hybrid or electric vehicle could be as simple and convenient as parking near an embedded charger at a home or in a parking facility. In the Toyota Global Vision announced in March, TMC expressed its commitment to leading the way to the future of mobility by integrating automobiles, homes and information technology. Wireless charging is just one of the many technologies TMC seeks to develop for the future.